Out going U.S. Marine Brigadier Gen. Roger B. Turner walks on the airfield after the change of command ceremony in Shorab military camp of Helmand province, Afghanistan, Jan. 15, 2018. A senior U.S. official said Wednesday the Trump administration’s Afghanistan strategy is working. “They [the Afghan government] are starting to see the Taliban concede, they are starting to see them move towards coming to the table,” said U.S. Ambassador to the United Nations Nikki Haley. Haley made the remarks after returning from a two-day U.N. Security Council mission to the South Asian nation, where diplomats met with Afghan President Ashraf Ghani, Chief Executive Abdullah Abdullah and other senior Afghan officials. FILE - U.S. Ambassador to the United Nations Nikki Haley speaks at UN headquarters in New York, NY, U.S., Jan. 2, 2018. Earlier this month, the administration announced it would suspend $1.9 billion in aid to Pakistan until Islamabad takes "decisive action" against the Afghan Taliban and the Afghan insurgent group known as the Haqqani Network. The funding freeze affects $1 billion for military equipment and another $900 million in payments to defray the cost of counterterrorism operations. Haley said the Afghan government asked the Security Council to apply more international pressure on Pakistan to get it to come to the table and change its behavior. “They continue to make 10 steps forward, and with Pakistan they feel like they continue to take steps backward,” she said. FILE - Afghan President Ashraf Ghani (C) and delegates stand for the national anthem during the Kabul Process conference, at the Presidential Palace in Kabul, Afghanistan, June 6, 2017. “We don’t think that we need to facilitate the peace process, we think we need to support the peace process,” she added. Afghan government negotiators and Taliban officials have reportedly opened “unofficial” talks in Turkey to discuss the groundwork for initiating a formal peace dialogue between the government and the insurgent group. 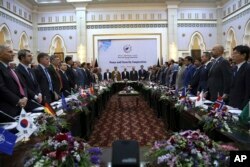 But both the government and the Taliban have tried to distance themselves from the Turkey meeting. Haley praised President Ghani’s government for progress on reforms, including fighting corruption and moving toward parliamentary elections later this year and presidential polls in 2019. “They need to be free and fair elections, but they also need to include every ethnic community — so that it is inclusive,” she said Wednesday. The Security Council will hold a high-level debate on the situation in Afghanistan Friday. U.N. Secretary-General Antonio Guterres is expected to brief members and Kazakhstan’s foreign minister, Kairat Abdrakhmanov, will chair the session.